Anointing Oil cannot be shipped outside of continental U.S.
Ra Un Nefer Amen did not decide to sit on the accolades lavished on the first volume of the series, which has already helped thousands of people around the world. The author has delved deeper than most teachers into the secrets of the Chinese Healing Science to invigorate the life force and its related functions in the body, mind and spirit. 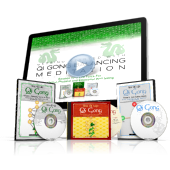 Volume 2 of the Ra Qi Gong adds the power /of essential oils, massaged on key acupuncture points, to remove blockages to the flow of the life force (chi) to vital organs and faculties governing the mind and psyche. The ability of the healing sounds to improve the functions of the body, mind and spirit has been taking to its maximum by the incorporation of the musical tones of the five energy organ systems, and the science of binaural brain waves to induce the healing state of the body during the qigong exercise. The volume adds materials that leverage the power of the mind (the "Yi") over matter (Chi), through the use of meditation scripts that are based on the correspondence of the virtues to the energy systems of the life force. Finally, the power of colors to invigorate the energy systems has been updated via modern advances in science to effortlessly leverage its usefulness. As with the majority with our clients of volume 1, most of you can expect relatively quick improvements in our physical and emotional well being, mental, artistic, and sports performance. Remember, that amongst the professional adepts of the Oriental martial arts (Tai Chi, Karate, Aikido, etc.) and meditation, Qi Gong is the grand mother of all practices.